When picking out golf gear, it is important to do your research and pick out the best product for you. The reason being is that it is crucial to ensure that what you are picking out is high-quality and, of course, the best for your level of experience. You do not want to buy thousands of dollars’ worth of golf gear and not know how to use it. This is why it is crucial to ensure that you are selecting a product that is ideal for your experience. With that in mind, this is very true when it comes to picking out the best golf clubs. If you are looking for quality, it is important to learn about how forgiving a club may be, if its easy use, if it has a lightweight shaft, etc. So, we have covered different brands from Callaway to Titleist and even Nitro. Now, we want to share with our audience the best from Tour Edge. This brand is known in the industry as a great competitor to mid-level range brands and their experience is superb. Let’s talk about the first golf club set on our list. Let’s begin! There are many brands in the golf community that create quality and expert products designed for the golf course, this is one of them. If you are an amateur golfer and you are looking for a quality set that is designed with everything an individual will need to start of their golf journey right, this is it. We are eager to share the very first club set from this brand, this is the bazooka 360 Complete Set and here are two features to consider. It is somewhat rare that you find a quality set of golf clubs where everything on the list is exclusively designed for quality and durability. Well, this set is exactly that. 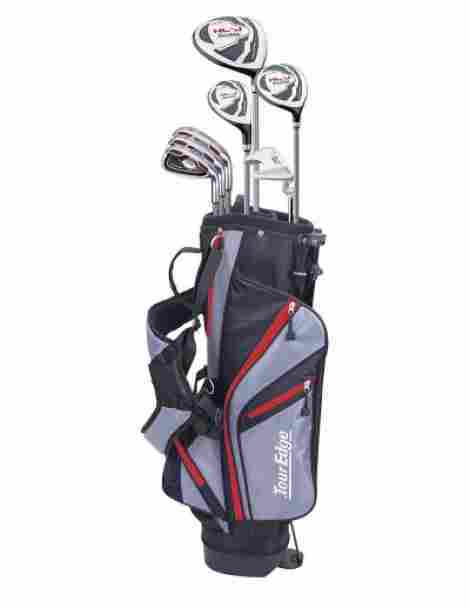 This set actually has a full package set with headcovers, a lightweight stand bag, and everything an individual will need to start their golf journey. Alongside this, the set includes everything from a putter to driver and woods. As part of the set, the set comes with a high quality and durable stand bag. The bag is a very simple bag with plenty of pocket space, so individuals can easily carry everything they need on the golf course. Alongside this, the bag is designed with a durable polyester and nylon material that ensures water resistant and wear and tear resistance. It is the perfect beginner bag for any individual. To discuss cost and value for this set, individuals can expect this set to be durable, high quality, simple, and come with everything needed to succeed. Alongside this, the set is designed with quality materials and everything an individual will need to get started right away. In fact, right now, the set is actually priced at one-hundred dollars the average price, making it a great addition to any golfer. The bag is rather simple. The bag is low quality. This next set on our list not only is extremely high quality, but it happens to look very stealthy, modern, and durable. This set is the Bazooka Graphite and Steel Set from Tour Edge and it has a great color choice. The color choice is black and grey with accents of yellow, which only add to the stealthy and modern look of the set. With that in mind, we highly recommend this set if you want a mid-level range golf set. Here are two features! The fairway woods of this family of clubs may be known as one of the highest qualities and best for starter golfers. The woods are designed with a shallow face design that allows individuals to have more ground clearance and forgiveness when golfing. With this, individuals can expect the design to be more durable, high quality, and expertly designed. This brand has designed this item with a deep center of gravity in every club. This allows individuals to receive more forgiveness and better hits on off-center contact hits. This is essentially perfect for novice golfers that want a quality hit and supportive experience when using the golf clubs, allowing for better practice runs and more security with every shot. To discuss the price and value for this particular set, it is costlier than the last and individuals can expect it to be well designed for all types of golfers. With this, the set also comes with a titanium driver, a quality modern putter, a durable stand bag with plenty of pocket space, and even comes with golf club headcovers. Titanium driver design with oversized sweet spot. Deep center of gravity with higher launch. Excellent design and high-quality material. Can be costly for a novice golfer. The stand bag is not very durable. We are onto product number three and we want to share with our audience another quality deal in the golf community. From the Tour Edge brand, we want to share two features of the Bazooka 260 golf set, what we call the ‘baby brother’ to the 360-golf set. Here are two features to consider this high quality and well-designed product. This item comes with a full set of fifteen pieces to consider. It has the fairway woods, the much-needed putter, a driver, and much more. 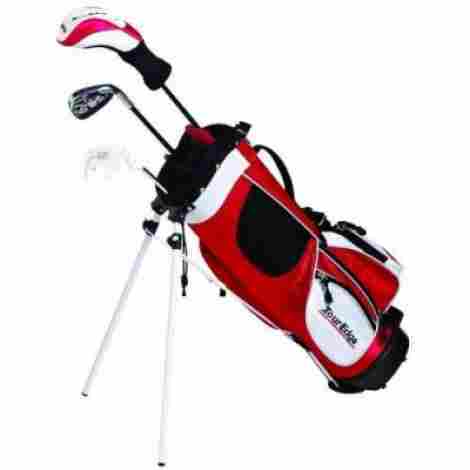 In fact, it even comes with a lightweight and highly durable stand bag with a strap, and it even comes with head covers to ensure maximum protection to the club heads. With this, it is a perfect set for individuals that want a golf club set for years to come. The stand bag of this product happens to be a very high quality and well-designed stand bag with easy access to every pocket. Part of the easy-pocket-access design is because the stand bag also comes with a backstrap, so it can easily be attached to a golf cart. With that in mind, we can say that this item ensures maximum quality durability, flexibility, ease-of-use, and also plenty of space for individuals to carry all important golf items. As far as the cost, benefits, and what individuals can expect, this is a great golf club set if you are considering a premium set with plenty of quality features. With that, this fifteen-piece set is priced at a lower price than normal, and it includes everything an individual will need to get started right away. Overall, we recommend this set for the design, the quality of the stand bag, and the new and lower price. Quality driver that delivers big distance. Iron set that includes easy-to-hit Hybrids. Accurate performance with long irons. Quality zipper design and durable clubs. The clubs are considered somewhat heavy. The driver is low quality. This next set on the list is particularly for the ladies and the brand has designed the set with female golfers in mind. Other than the color choices being extremely beautiful, pleasing to the eye, and well designed, this set ensures maximum fun on the golf course with an accuracy rating of 98% with every club. This is the Ladies Reaction 3 Complete Set and here are two expert features of this item. We have to first share the beautiful and eye-catching color design of this product. The color design is a purple, grey, and silver color design that is striking. 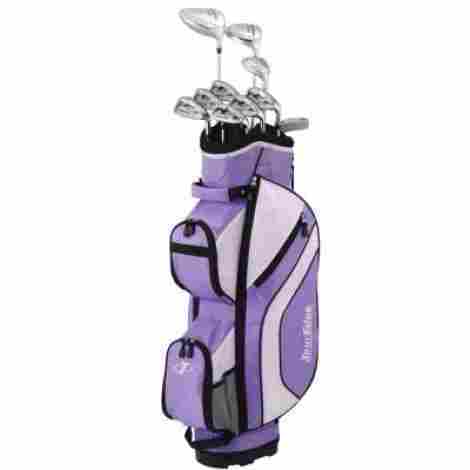 With this, each club is made of silver and purple accents and the stand bag is a mauve color that is very beautiful. Individuals can expect that it may get dirty, so you want to clean it as often as you are out on the golf course to keep the color true to its nature. Now, this is a feature worth touting! We truly respect a brand that cares about their customers enough to give them a lifetime warranty on their products. Well, this item happens to have a full lifetime-warranty that ensures individuals can easily and effortlessly replace any damaged areas or aspects of the set. This builds a trust with the brand that ensures customers happiness for years. As far as price, value, and design, individuals can expect this item to be well worth it. If you want to gift your wife a beautiful club set, or you are looking for an appealing ladies golf set, this is it. Now, it is important t keep in mind that the clubs and overall design of this product are built to more lightweight to appeal to a female audience. With that, it is well designed and constructed to last for years. We highly recommend it, especially if you are a fan of purple! High quality and durable driver. Iron set includes an easy to hit hybrid. Not as heavy as some individuals would prefer. Speaking of a quality set for women, we want to share a more subdued set from this brand that is designed to impress individuals because of your sure-fire shots and not the color of the set. Designed with everything an individual will need to get the starter right away, this set is well designed, high quality, and simple to use. Here are two features of the Female Lady Silver Set from Tour Edge. This product is designed with technology and design in mind. The durable design of this item ensures high-flying and accurate performance shots for every individual. This is also accomplished with high quality and lightweight graphite club designs that ensure masterful gameplay on the golf course. With that, individuals can expect each club to be of the best material quality, durability, comfort, and of course, performance. 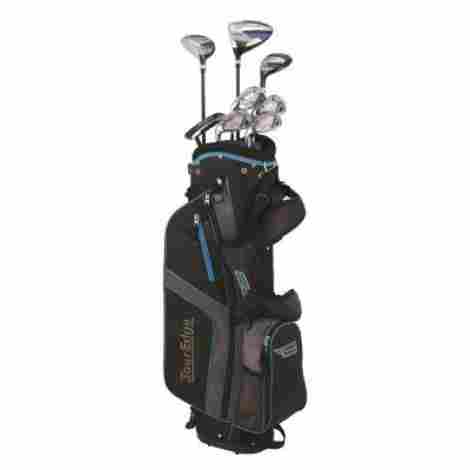 The particular cart bag of this set is a high-quality deluxe cart bag that ensures the most professional features. To start, the material is a blend of polyester and nylon that is high quality, well-designed, and guaranteed to last. Alongside this, the bag has cart attachments and features nine quality accessory pockets ranging from a valuable pocket to an extra-large shoe pocket. As far as cost and value, this item is well designed and perfect for the golfer that wants a lightweight club set design. The silver and black finish make the set look very sleek and beautiful, while also being subdued. The primary aspect to note and keep in mind is the particular set of clubs, which is particularly designed for quality and performance. Design technology that delivers high-flying shots. Full set to get started ASAP. Deluxe cart bag with nine accessory pockets. Silver and black finish design that is well executed. Can be a costly set. As the next ladies set on our list, we want to share a forgiving set that ensures maximum accuracy and performance, even for novice golfers that are a bit unfamiliar with how to properly golf. In fact, this is a great set for the amateur that wants to perform like an expert. We want to share with our audience two expert features of the 2014 Lady Edge Plus and what individuals can expect as far as design quality and benefits. The stand bag of this particular product happens to be of the highest quality material design and guaranteed to last. In fact, this stand bag is made to be durable, lightweight, and very easy to use. Two of the best features of this product is the fact that all of the pockets have easy access benefits and the stand bag itself has a kickstand, so individuals can easily open the kickstand and use it. The set itself is a very simple and high-quality set. The set includes everything from the durable fairway woods to a great driver that ensures highly accurate shots and even clubs with deep center gravity weight technology to ensure better hits and performance on the golf course. Overall, this set is guaranteed to help amateurs perform well and most importantly, have a lot of fun on the golf course. To discuss cost and value for this, we see this set as a high-quality addition to any golfer. Not only is it fun to use, but women will feel a sense of confidence when using this set. Also, the blue and white color tone of the set makes it a highly appealing set to consider for the golf course. With plenty of benefits and the fact that you do not need to buy any extra pieces, we recommend this set. Quality design technology that delivers high flying accuracy shots. Durable stand bag with kick stands. Deep center gravity technology in every club. Well priced for the benefits. This next set is one of the highest quality sets that individuals can consider if they want premium quality performance and top-of-the-line construction and craftsmanship. 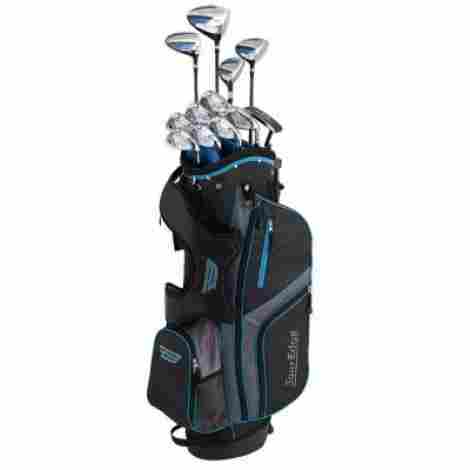 This is the Moda Silk Golf Set and it happens to have numerous color choices, configurations and comes with a complete 20-piece design that is very valuable in the marketplace. Here is the first feature of this item! This product is designed for professional golfers that want value and performance. Part of this leading value comes from the high quality and masterful design of each club. Each club head is designed exclusively for performance shots, forgiveness, masterful on-contact with ball benefits and more. However, it is the ultra-light shaft that is worth mentioning. This shaft is designed from graphite and ensures a higher launch yield with longer shots, giving individuals a better-quality return with every hit. The design of this particular product is an all-inclusive design that ensures masterful craftsmanship and durability. No part of this set was overlooked, ranging from the color design to the stitching, the quality of the zippers, and even the masterful flat bottom stand design. The design is a silky and soft exterior with an underlined material quality that ensures wear and tears resistance. To discuss the price and value of this set, individuals can expect this set to serve for years to come and give individuals that want to be professionals an added bonus of experience and quality. With that in mind, we want to share with our audience that the price is a bit on the hefty side, but it is due to the overall quality, durability, benefits of each club, and the all-inclusive set as a whole. Available in several color choices to choose from. Different configurations to choose from. The all black design is not for everyone. 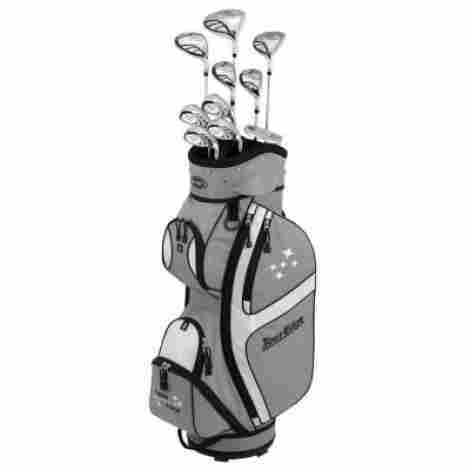 This next quality golf club set is well designed and expertly crafted with value and performance. Now, the trick of this particular set is that it is specifically designed for teens. This is known as the Varsity Bazooka 360 Teen Set and it comes with everything a teen will need to get started on the golf course. If your son or daughter has shown a passion for golf and they are wanting an expertly designed set, this is it. Let’s talk about the features! This set is a full all-inclusive set from the Bazooka series of this brand. Therefore, individuals can expect the set to offer maximum value and quality features. For instance, it comes with everything an individual will need ranging from a 460cc driver to a full iron set and even head covers to keep all of the clubs protected when in storage or rainy weather. This item comes with two of the most important items in a golf club set that an individual will need to perform well on the golf course. This product is designed with a high-quality putter and bag. The putter is a high-MOI putter that is lightweight, includes track-lines and is guaranteed for performance value and dynamic quality design benefits. As far as price and value, considering that this set in particular for teens, individuals can expect the set to be underpriced compared to most adult sets by this brand. However, the set is still of the best material value and design, including an array of features that ensure that your son or daughter will get good practice in. With left hand and right-hand orientation options, this set is well designed. Lightweight stand bag and cover. Iron set that includes a quality hybrid. This next set can be considered the baby of the whole family. 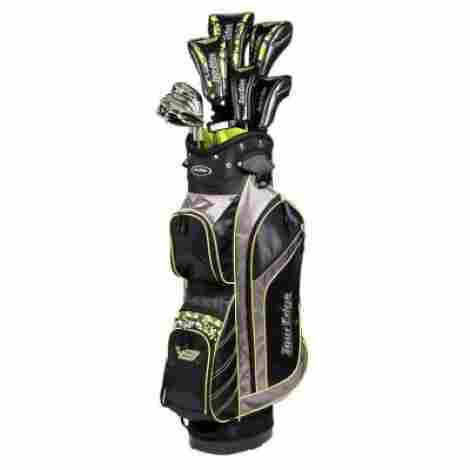 In fact, this set is particularly designed for juniors and young adults that want a quality set for the golf course. If your son or daughter has shown a love for the sport of golf, this is the set to gift. This is the HT Max J JR Set and we want to share two features of why this is a perfect set for young teens. 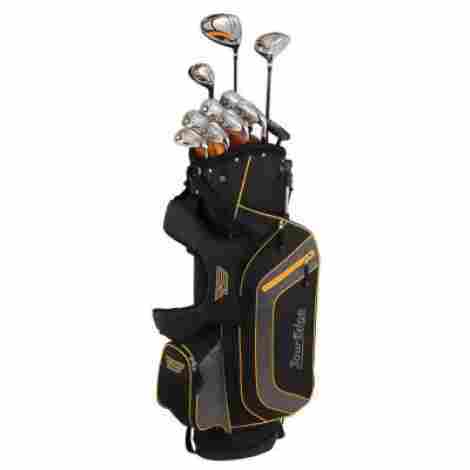 This particular set is a five-club starter set for individuals that want the basic of a high-quality golf set. The golf set includes a driver, hybrid, stand bag, iron, and putter. With this, any junior can begin to practice the basics, adjust their swing, learn the tempo, and maximize their performance before they move onto a full club set. This set is designed with juniors in mind. Therefore, each aspect of this set is designed to be smaller, more lightweight, and more compact, without removing the design benefits and functionality of each club. For instance, each shaft is made to be more lightweight and designed to have a lower kick-point for easier launches and more air. What guarantees individuals the most value is that this club is the perfect way to start with your are a teen wanting to learn golf. With that, this set is high quality designed, guaranteed to last, and has everything you will need to get the ball off the tee. The price also reflects the fact that it is only a five-piece set. However, it even has a quality stand bag with different pockets for enhanced use. Quality set for adult teens. Includes hybrid, wood, and putter. Durable design and very lightweight. Has everything an individual need to get started. Not as high quality as other junior brands or sets. Well, now that we have come to product number ten, we have talked about men’s club sets, women’s and even juniors. With that, we want to add to the next set by adding a junior set that does not come with only five-piece, this is a full set. This is known as the HL-J Junior Complete Set and we want to share with our audience two features of this product. This particular set may be one of the best bangs for your buck deals. In fact, this set comes with multiple sizes to consider, different hand orientations, different color choices, and more. With that, a parent or teen can select their design based on their age and how many pieces they desire, allowing for more variety and different options to choose from. The design of this set is actually of the best value. Individuals can expect the design to resemble professional sets with many different design features and qualities. The design overall is designed for kids and teens but boasts expert quality features worth considering. In discussing cost and value, this set allows kids to receive a full golf set experience. Alongside this, the set is designed with advanced hybrid technology, quality fairway woods, and some of the best design qualities to consider. The stand bad resembles modern day quality golf bags and even has a cart strap and plenty of pocket space. Overall, for the price, it is more than enough for a starter teen that wants to golf. Wide sole and low center of gravity. May be a bit heavy. When selecting the best quality items, what is it you are looking for? Are you looking for lightweight use, quality design, appeal, or experience? Are you wanting a product that you can use for years to come, or do you want more of a practice club? These are some of the many questions to ask yourself when it comes to selecting quality gear and products in the golf community. With that said, there are also different ways to identify a product and to choose the best item for you. In this case, we want to share with our audience the criteria used for evaluation and the different aspects that they can look out for when selecting a quality golf club. Let’s begin! As part of the criteria, the first aspect when selecting a quality product is to know what you want. With that, our goal with this list was to share variety. So, we first shared quality golf club sets for men, then women, also kids and juniors. With that, it is important to understand and know exactly what you are looking for in a quality golf club set. Therefore, we want to identify the most important areas to consider when picking out a quality set. The shaft and the grip of the product. Do you want an amateur set or for professionals? The configurations of the shaft? Do you want a full set or specific clubs? Do you want head covers included? Are you looking for a specific design or benefit to the club? What kind of shaft flex are you looking for? Is there a specific color design you want? Is the set for women, men or kids? With that said, questions like these will help identify which set is the best for you. Now, we want to move onto another criterion that guarantees maximum quality value for your purchase. As other criteria to consider, identify what kind of set you desire. For instance, there are sets that are designed as half sets for individuals that do not want a fourteen-piece set but want the basics of golf clubs ranging from driver to putter to irons. With that in mind, it is important to identify what you are looking for from your set and the quality design of that specific set. Some sets come with a very small stand bag and don’t even include headcovers as part of the design. With that in mind, it is important to identify what the set is designed for. Some sets are designed for juniors, while some sets for adults are designed for training. With that, this brand offers a wide variety of different set designs that range from amateur range to professional range. Let’s focus on the next criteria. As far as cost and value, we want to share with our audience that the overall price of the product that you select will range depending on the product design and what it is intended for. For instance, junior golf clubs tend to be lower than professional adult products. Another aspect that causes the price to fluctuate is whether or not it is designed with high-quality materials or if it happens to be more of an amateur set. With this, it is important to consider the cost and value. If you are an amateur, there is no need to purchase an expensive and feature-filled set. A simple set that allows for perfect practice is good enough. With that in mind, here are the ranges of amateur sets and professional sets from lowest price to highest price. That is not to say that mid-level sets are also not professional. However, some professional sets are quite costly because they are handmade and designed with some of the highest quality innovations. Now that we have shared the main three criteria in selecting a quality Tour Edge product, it is important for individuals to recognize that this criterion can be implemented into many different scenarios and brands. With that, we want to answer some of the most asked questions when it comes to this brand. Q: Does the club set come with headcovers? A: Actually, yes! This is one of the few brands online that sell their clubs with headcovers. In fact, their headcovers are all designed as a set to match the stand bag and the club design. Q: Does this brand have stand bags that stand-alone? A: They do actually! This brand sells some of the highest quality stand bags that have a kickstand design. Q: Are their stand bags waterproof? A: Many of the bags that we shared happen to be 100% water-resistant and designed to be able to withstand some weather elements. However, it all depends on the individual product, the material, and the design. Q: What is the material of their shafts? A: This depends on the specific club set design. However, most shafts tend to be made from graphite, stainless steel, or steel. Q: How do you clean the club grip and shaft? A: A clean wet rag will do!